A wonderful house in a great location. The bathroom is stunning, bedrooms are huge, a well equipped kitchen with a beautiful pool. We really loved the decor. We made full use of the outside cinema screen! Its a very private property within a short distance to the beach and local restaurants. The host was very quick to answer my questions and offer help when needed. 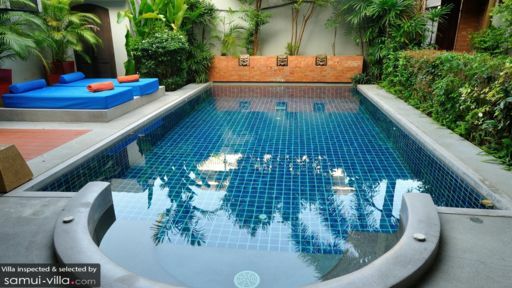 I booked Villa Tawan for 6 nights, sharing with my friend and her father and our 2 children. We were delighted with the beautiful villa and the service we received from the managers and staff at Ban Tai estate. They provided us with Airport transfers, and I organised to have the fridge stocked with specified food items for our arrival which was a great service. The kitchen had everything we needed including microwave and a coffee maker. The staff were there to assist with things like operation of the two screens and we accessed movies through our Australian Netflix account. We felt safe and secure there and the kids loved our private pool. We were given VIP cards to use the pool facilities and towels at La Perle on the beach where we enjoyed cocktails in the infinity pool and the glorious sunsets. We enjoyed walking to the beach and the restaurants around there. My friend and I also enjoyed the massage treatments available nearby, which were relatively inexpensive. We used a great family run taxi service to go out at night to Maenam restaurants, and particulary enjoyed John's Garden restaurant with its fairy lights and intimate atmosphere. We found the villa at Ban Tai estate provided us with a comfortable, attractive and relaxing place to stay in a lovely peaceful location. We really appreciated the friendly and attentive service from staff who helped to make our stay there so enjoyable and I give them a high recommendation.